So, what are the things you need to do to shine at work? Is there a short cut to that promotion you are looking for? Are you thinking about shining at work? For those of you who are familiar with the theme of this site, you would know that here you won’t find any quick fix. However, shining at work is easy if you bring the right attitude, enthusiasm and action. Nothing beats a focused mind, a determined attitude and resolve for acting upon that conviction. If you have all these ingredients, then your answer to that question - “how to shine at work?” would be easy to answer. There are attitudes and guidelines you can follow in order for you to shine at work. Reading these though, would not help you shine at work. For some of you, some of the tips included in this FREE Career eBook would act as a reminder. Yet, others may pick up a gem or two. But remember that to shine at work, you need to DO. Do not just read and expect to shine at work. Read and put some of it into action consistently. Bring the right attitude and this will be a quick read for you to shine at work. 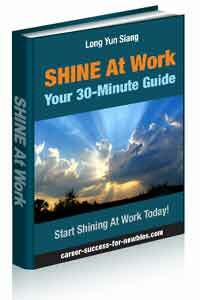 You can view SHINE At Work: Your 30-Minute Guide online by clicking here, or you can download download the pdf file here, which you can read on your computer at your leisure. Do you think visitors to your site will benefit from these FREE articles and eBooks? You have full permission to distribute in your ezine, website, blog, forum, RSS feed or print publication and/or distribute it as a free bonus with other products, provided it is left completely intact, unaltered and delivered FREE and not be sold.